Subsequent to the release of the K70 RGB MK.2, Corsair brought to market a new version featuring Cherry MX Low Profile RGB Speed switches, released this year and exclusive to Corsair. Since I’ve already reviewed the original keyboard, I’ll take less time here detailing it. I came away from the K70 RGB MK.2 very impressed, though, and it ended up earning our highest possible accolade. This newer version thankfully retains the various design characteristics, features, and accessories that made the original so good. For instance, the unibody aluminium faceplate with its brushed finish makes for excellent build quality, and large rubber pads on the underside keep the keyboard in place regardless of whether you opt to use the flick-out legs on the underside or not. Speaking of the underside, Corsair has done away with the cross-shaped cable routing channels, which is fine since they weren’t designed well enough to be useful. The K70 RGB MK.2 Low Profile RapidFire has a 1,000Hz USB polling rate and comes with full-key rollover and 100 percent anti-ghosting. It also offers a single pass-through port accessible on the rear near the thick cable, though annoyingly Corsair still refuses to upgrade this to USB 3.0 standards. It should say a lot, though, that this is my biggest complaint. As you would expect when spending £160, this is a very feature-rich keyboard. For instance, you can reprogram any key with a huge variety of functions and custom macros, and stack layers of RGB lighting also on a per-key basis. To do these, you’ll need to delve into Corsair’s iCUE software, which is a huge improvement on its efforts from just a few years back. I’ll direct you to my original review for a more detailed overview of that, but suffice it to say here that it’s stable, intuitive for the most part, and very powerful. Even the top Corsair logo and fixed-function keys can have their RGB lighting customised, though the indicator lights are fixed in white. Something that I particularly like about the K70 RGB MK.2 is the combination of hardware- and software-based profiles. You can have up to three hardware-based ones, which are stored onboard the keyboard itself and can thus execute certain custom functions and lighting effects without ever running iCUE, while software-based ones are practically unlimited but need the software layer. While some people prefer to keep everything onboard, the downside is that more complicated functions and effects cannot run on hardware alone, and functions like auto-switching profiles based on the app you have running in the foreground also rely on software. 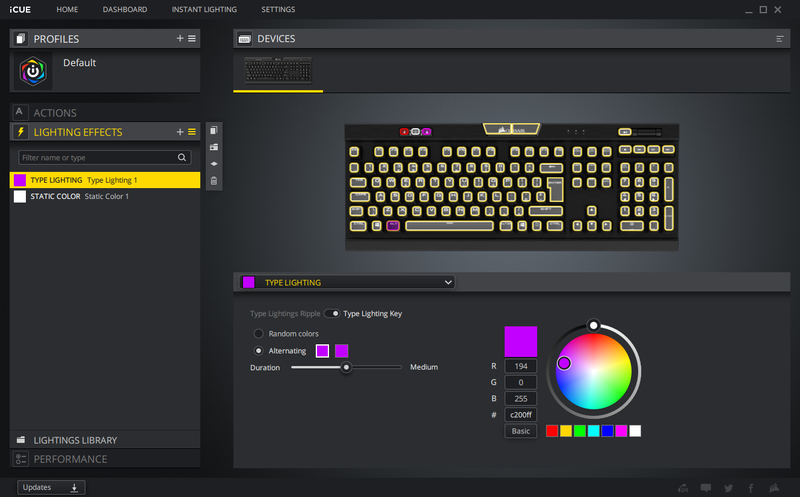 Corsair’s approach gives you the best of both worlds, and the iCUE software is particularly adept at making clear what is and isn’t possible on each type as well as at giving you control over what profiles you store onboard. You will need iCUE to edit your hardware profiles, but once they’re saved you can close it and even uninstall it if you wish. As well as the usual keys, Corsair gives you a great selection of dedicated ones. The media keys are a particular highlight thanks to the inclusion of a high quality metal volume wheel. You also have a profile switch button, brightness control, and Windows key lock (can be programmed to lock off other functions too) clustered as a trio along the top edge. In terms of accessories Corsair still supplies a key puller, which is useful in its own right for cleaning but is mainly here to assist in replacing the default FPS keys (WASD) and MOBA keys (QWERDF) with Corsair’s specially crafted ones. Featuring a light grey colour, sharp contours, and a rougher texture, they’re designed to stand out, but I’ve never found them that useful in games and they’re hugely distracting when typing. Lastly, a wrist rest is bundled as well. This attaches via simple plastic clips and is large enough to be useful, but I’m still not sold on the texture used and would prefer a smoother finish. So far, so good. However, it’s the switches that need to impress the most. Cherry MX Low Profile RGB Speed are very much like the company’s Low Profile RGB Red switches, featuring a linear action with no bump or audible click, a total travel distance of 3.2mm (down from 4mm on regular Cherry MX switches), and a light actuation force of 45cN (the same as Cherry MX Red switches). Of course, they also have a surface-mounted RGB LED as well as a clear plastic housing to help disperse the light. The difference comes in the actuation distance, with this having been reduced from the already-low 1.2mm to just 1mm here. Corsair deploys low-profile keycaps atop the switches, with the overall result being a keyboard with a significantly flatter look. You may or may not prefer this; personally I think it looks smart. Lighting quality is also good with these new switches, with whites looking neutral and other colours represented vividly and accurately. Peak brightness is a little dim, but the switch housing distributes light fairly evenly and doesn’t leave any spots too dark, even on keys with symbols etched into the lower sections. I didn’t have any keyboards with Cherry MX Low Profile RGB Red switches to compare side by side, but I’d bet that the vast majority of gamers would be unable to tell them apart in a blind test. What I can say is that the response on these new switches is very nice. The lack of tactile feedback may put off some, but there’s a crispness to linear switches that is hard to match, and the low key travel coupled with a low actuation point/force leads to a very responsive feel both when typing and in games, although it certainly didn’t make me a better gamer - that's a lost cause. I certainly noticed that I was using less effort than usual to hammer out poorly written reviews, though. Something of a side bonus is the fact that the new switches are much quieter than any regular sized Cherry MX switches both when bottoming out and on the rebound. It’s still a little more clacky than your average rubber domed keyboard, but not by much, and the response is of course many times better. Taking an already-successful design and continuing to use already-great software, Corsair would have had to try pretty hard to make this a poor product. Thankfully, the swap to the new exclusive switches is a success and simply adds another choice for gamers looking to get their hands on one of the best keyboards available. The difference between US and UK pricing is a bit tough to swallow on this side of The Pond, but it isn't out of line with what competitors are charging for similar models, so the award stands.